One of my favorite architects, William Hefner, has recently revamped his website. Many of the projects in his portfolio are now organized by house. It turns out, some of my favorite pictures of his work are all from the same home (presumably in Los Angeles). 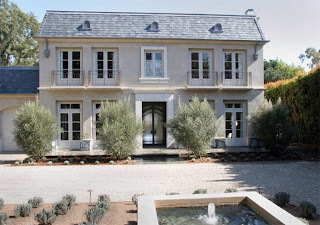 Overall, the exterior of the house is French in style. I love the doors that flank the front of the house, but I am not such a fan of the front door itself. It has an art deco vibe to it, which normally I like, but I can't help but wish that the owner had stayed with the feel of the rest f the house. To me, this is a beautiful room architecturally. I love the floor to ceiling doors (which are part of the front of the house), the high ceilings, the placement of the fireplace. If I ever build a house some day, I am going to use this picture as an example of one of my favorite rooms! Same room, different view, and styled differently...notice the photograph above the fireplace instead of a mirror, and the bench. Different flower arrangement and pillows too. I much prefer a mirror above the fireplace. 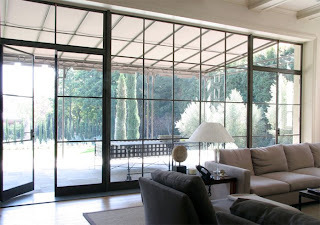 I have seen a wall of windows in some homes in California, and it has quite a contemporary feel to it. It is a bit contemporary for my taste, but I love the effect, and find it quite striking. Can you imagine entertaining in this room? On a nice night, you could have quite the indoor/outdoor party (the backyard looks huge). I love the simplicity and colors of the kitchen. I wonder what that countertop is made out of? Different view of the kitchen. The kitchen is set on the interior, and the casual dining area is set by the window. I wish there were a picture of the window by the table. I imagine it faces the back yard, and is to the left of the room with all the windows. 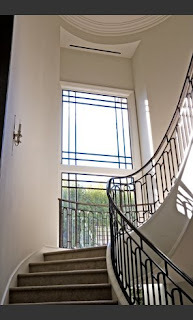 The stairs have an art deco vibe to them, similar to the front door. The powder room has that art deco feeling too. I love the mirrored wall behind the sink. The master bedroom. 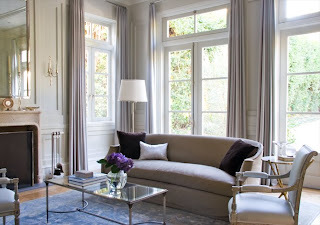 Again, wonderful architectural details - high ceilings, lovely molding and trim. The sunlight streams in the windows. I love a house that is filled with light, just as this one is. Since I am fixated with bed pillows now, I immediately noticed the pillow arrangement; they are suprisingly low given the height of the headboard, but I like how simple and uncluttered they look. 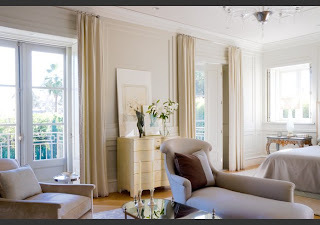 Two French doors with full shutters let even more light into the room, and step out onto a private balcony. A simple sitting area for the master bedroom. I love the streamlined decor in this room. I don't really have a good feel for the flow of this house from the pictures, but it is fun to imagine how the rooms all fit together. 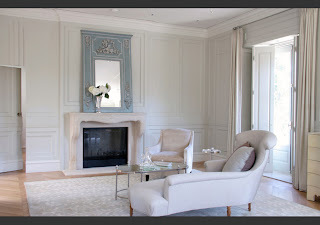 Check out William Hefner's website for more amazing architectural and interior design. Mr. Hefner's work is amazing! Thank you so much for writing this post. I had never heard of him. Those windows are absolutely incredible. They would add so much architectural interest to any room. I am picturing a fabulous evening cocktail party from your description. The kitchen is just beautiful. I love that it is a classic kitchen, but it has elements that make it look more modern, especially in the second picture. 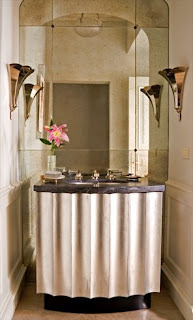 I also love the mirrored wall behind the powder room sink (though I don't love the console). I think having an entire antique mirrored wall is a great, unexpected touch. Beautiful, beautiful work! FYI, The countertops in the kitchen is stainless steel with a random orbital finish. It's edged with a zinc moulding. Yum, Yum Yum. Those interior shots are sheer perfection. 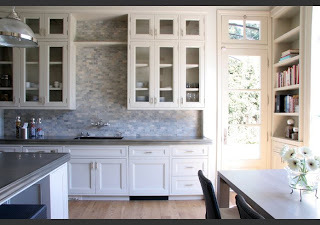 I love the creme walls, paned glass and all of the supple textures - everywhere. That's a home I'd love to live in! What a beautiful place, I love that kitchen! I adore the powder room! i love an architect that believes in symmetry (as well, as high ceilings)- it is near impossible to decorate successfully around oddly placed and ill thought out doors and windows. nice stuff! Absolutely beautiful spaces. I've put a few of those images (kitchen, living room) in my "dream home" file. That kitchen is really my dream kitchen. The counter top on the island looks like zinc to me. Oh is that staircase beautiful! Wow. I really love it all, but especially the kitchen. It looks very serene. Yes, this house is a bit empty. It does not look like anyone lives there! Yet, perhaps that was the intent of the architect (in these pictures) as the focus is truly on the architecture. Oh my goodness, this house is Totally amazing!! The lines and architectural elements are yowzers!! Not to mention the kitchen which is to die for. I'm saving it for my inspiration board. I'm in the midst of decorating so your blog is the quintessential eye candy for me. I can't decide what room I love the most~kitchen, powder~and what about that staircase? Just completely lovely.